The direct-to-consumer brand — with a sharp focus on a single category — is one to watch. It&apos;s common practice for designers to expand into new categories in order to build a lifestyle around a brand, which in turn offers consumers more options to shop. But new label Ammara aims to streamline this experience by being an online destination for one thing only: tops that rank among luxury labels but ring in at a contemporary price point. Designer Ammara Yaqub&apos;s sharp focus is the result of her own struggles with finding the perfect shirt, whether for day, night, or a business casual wardrobe. And her idea aligns with the current boom of single-category, direct-to-consumer brands. After running surveys and focus groups with anyone who was willing to help, Yaqub’s findings helped solidify her business plan and she launched Ammara in June of this year. "There&apos;s very much a connection with a customer now that didn&apos;t exist when you went to a wholesale channel," says Yaqub. "I think in the past a designer comes up with a collection from an inspiration, and then produces 50 pieces and puts it out in the world. That approach is antiquated. It really needs to come from a place where [it&apos;s] what people are really looking for." Yaqub&apos;s realization comes from firsthand experience. After a career in investment banking, she enrolled at Harvard Business School, where her studies on Neiman Marcus lead to an interest in fashion. A number of professional gigs in the industry followed: managing wholesale at Zac Posen and buying for Louis Vuitton and Saks Fifth Avenue. She eventually launched her own ready-to-wear label in 2010 before she switched gears to concentrate solely on tops. "It&apos;s much easier to shine in a category where you are preeminent," says Yaqub. Ammara launched with 12 styles of tops that showcase close attention to quality and fit. Instead of using the ubiquitous cotton poplin, Yaqub prefers an exclusive Sea Island cotton that costs nearly four times more, as well as 100-percent silks, like four-ply crepe, that&apos;s typically used for couture and bridal garments. And by cutting out the middle man, these shirts come with contemporary prices, from a blue cotton sleeveless top at $275 — the "Anouk," a bestseller — to a $595 lambskin leather short-sleeve shirt in navy, named "Péron," with pony-hair stripes. "I truly believe in providing real value to the customer in a time where everybody is craving for a sale," says Yaqub. The designer-name luxury tops that come from the same New York City factory as Ammara can go for at least double the price of the brand&apos;s most expensive piece. Since Yaqub doesn&apos;t follow the traditional fashion calendar for Ammara, there&apos;s also little competition with bigger players in the industry when it comes to manufacturing and resources. This also allows for a quick turnaround of product — on average, six weeks — so Ammara plans to release three or four styles every two months. For later this year, Yaqub is most excited about the brand&apos;s holiday collection, which plays with new textures, is more layer-oriented and will include a new sweater. "We&apos;re doing some interesting things," she says. "Tops are tops, and we don&apos;t want to get boring with them." 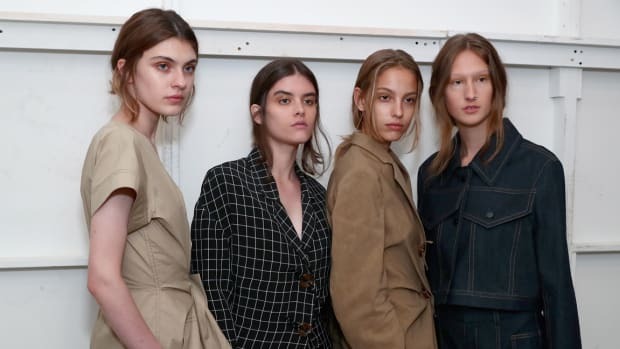 The former creative directors behind Helmut Lang have been quietly building their own understated-luxury brand. The Polish brand made its New York Fashion Week debut with a buzzy spring 2017 collection. The designer's preference for private appointments over fashion week, and knack for innovative print design, has helped his namesake brand grow. The brand's designers are sure to capture more fans around the globe with plans to show in New York and Paris next month.